The setting sun glints off the Amazon River and numerous lakes in its floodplain in this astronaut photograph from August 19, 2008. Large areas of sunglint are common in oblique views (shot from an angle, rather than looking straight down from the spacecraft). About 150 kilometers of the sinuous Amazon is shown here; the area is about 1,000 kilometers inland from the Atlantic Ocean. Arrows show the generally eastward direction of flow of the Amazon. 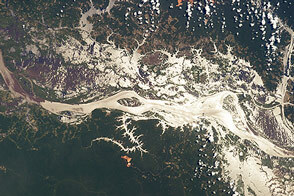 One of the great river’s tributaries, the Uatumã River, enters on the north side of the Amazon (top center). A small side channel, or distributary, of the Madeira River (beyond the left edge of the image) enters the view from the left. 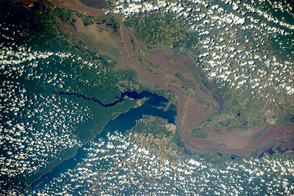 Tupinambarama Island occupies the swampy wetlands between the Amazon and Madeira rivers. 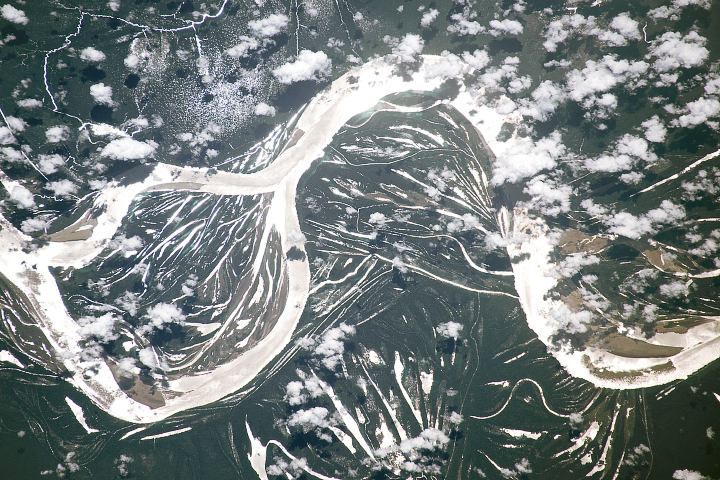 Sunglint images reveal great detail in surface water—in this case the marked difference between the smooth outline of the Amazon and the jagged shoreline of the Uatumã River. The jagged shoreline results from valley sides being eroded in relatively hard rocks. Because the Amazon flows in its own soft sediment, its huge water discharge smoothes its banks. The Uatumã River in this area has become a ria, a dammed valley. Sediment from the Amazon has created the dam. Another dammed valley is visible at bottom center of the scene. Although no smoke plumes from forest fires are visible in the view, two kinds of evidence show that there is smoke in the atmosphere. The coppery color of the sunglint is typically produced by smoke particles and other aerosols scattering yellow and red light. Second, a small patch of cloud (image right) casts a distinct shadow in the atmosphere. The shadow is visible because smoke particles in the surrounding sunlit parts of the atmosphere are reflecting light back to the camera. Astronaut photograph ISS017-E-13856 was acquired on August 19, 2008, with a Nikon D2Xs digital camera fitted with a 400 mm lens, and is provided by the ISS Crew Earth Observations experiment and the Image Science & Analysis Laboratory, Johnson Space Center. The image was taken by the Expedition 17 crew. The image in this article has been cropped and enhanced to improve contrast. Lens artifacts have been removed. The International Space Station Program supports the laboratory to help astronauts take pictures of Earth that will be of the greatest value to scientists and the public, and to make those images freely available on the Internet. Additional images taken by astronauts and cosmonauts can be viewed at the NASA/JSC Gateway to Astronaut Photography of Earth. Caption by M. Justin Wilkinson, NASA-JSC. 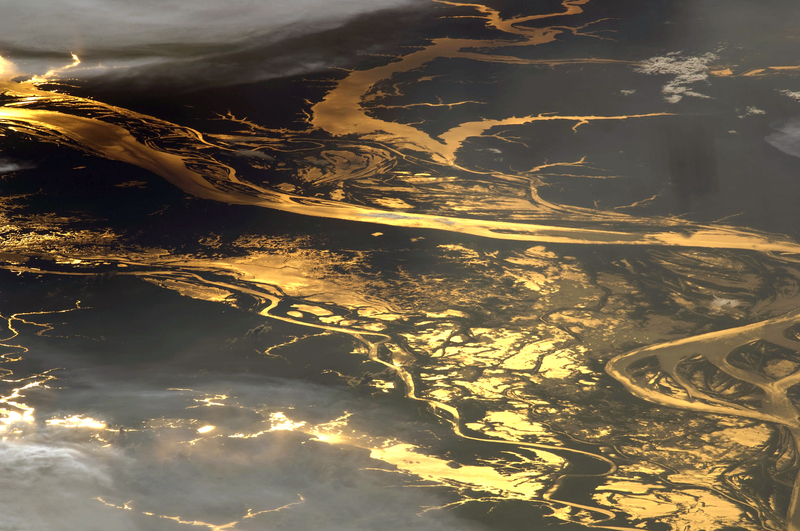 The setting sun glints off the Amazon River and numerous lakes in its floodplain in this astronaut photograph from August 19, 2008. Large areas of sunglint are common in oblique views. 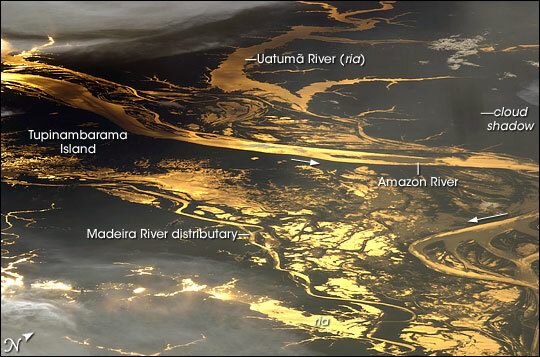 Sunglint images reveal great detail in surface water—in this case the marked difference between the smooth outline of the Amazon and the jagged shoreline of the Uatumã River.